Starting Kendi's 30 for 30 challenge, winter edition, reminds me of the last (and only) time I joined in the remixing fun. It was summer, and my thirty picks were filled with sandals, tanks and shorts. And as I look outside and see a blizzard, (I'm not kidding) I'm learning just how different this round is going to be. If you live in the midwest and notice the lack of snow in the pictures below, you'll know that I fudged a bit and these pictures are not from today. I decided to start a little early, knowing full well there would be a couple of days where I wouldn't be able to get pictures taken this week. If the snow keeps up, I don't think I'll be doing much of anything this week. omg! i really want that mustard skirt, REAL bad!!! do they still have it!??! and the shoes? i recognize those, haha!! :) and now i wish i bought a pair! Love this skirt!! I think I mention that every time you wear it;) I like it with the all black and that awesome necklace. Hope you are surviving all the snow I've been hearing about! We only got about two inches. I was kinda hoping for a big storm again. I, too, love the skirt! Isn't this snow ridiculous?! I LOVE this look!!!! Fabulous start! I fudged a little and started yesterday, so I'm actually wearing "day 2" today - lol! I love how you styled this skirt today. Everything about it really- the necklace is a nice compliment and I love your shoes!! What a great first outfit- you just set the bar pretty high! I love that skirt more every time I see it! When you posted your 30 items I fell in love with this skirt - love it! 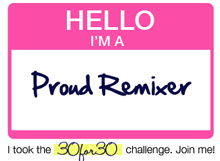 You are definitely off to a great start in the remix challenge! This outfit is stellar!!! Love the necklace, the skirt, the shoes -- everything! I am pretty sure I have said it before but LOVE that skirt! And nice combo of black and brown here. This 30 day challenge will be fun!! i LOVE this outfit!! the necklace and skirt go great together! Don't get snowed in!! You look fantastic. I may need to borrow this, I have all the pieces...hmmmm. We have been watching the snow storms on the news all day. I hope all is ok. I love this skirt...seriously a fab rockin cool outfit...is that enough adjectives for you?? lol..you look great...and you really are off to an amazing start with your first outfit...cant wait to see more!!! ok, i LOVE this skirt. It really stands out against the black and the necklace is the perfect touch!!! So pretty Shea!! Love the mustard and ketchup color pairing. That is SUCH a lovely skirt! I will have to find one after the 30 x 30 remix ;). OMG, that skirt is amazing! I love that color so much! love the skirt! I feel like it could go with anything. Style staple.